This post will cover some new dataset functionality I’ve recently added to Incanter, including the use of MongoDB as a back-end data store for datasets. Next load some CSV data using the incanter.io/read-dataset function, which takes a string representing either a filename or a URL to the data. See the documentation for get-dataset for more information on the included sample data. We can get some information on the dataset, like the number of rows and columns using either the dim function or the nrow and ncol functions, and we can view the columns names with the col-names function. We can see that there are just 50 rows and two columns and that the column names are “speed” and “dist”. The data are 50 observations, from the 1920s, of automobile breaking distances observed at different speeds. 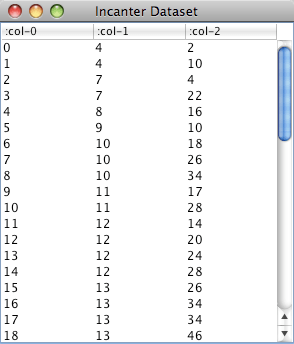 I will use Incanter’s new with-data macro and $ column-selector function to access the dataset’s columns. Within the body of a with-data expression, columns of the bound dataset can be accessed by name or index, using the $ function, for instance ($ :colname) or ($ 0). 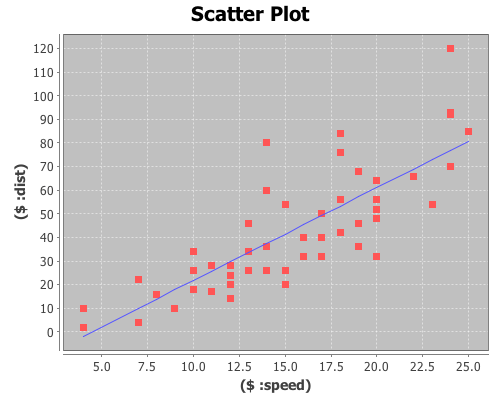 For example, the following code will create a scatter plot of the data (speed vs. dist), and then add a regression line using the fitted values returned from the incanter.stats/linear-model function. Within the with-data expression, the dataset itself is bound to $data, which can be useful if you want to perform operations on it. For instance, the following code uses the conj-cols function to prepend an integer ID column to the dataset, and then displays it in a window. The conj-cols function returns a dataset by conjoining sequences together as the columns of the dataset, or by prepending/appending columns to an existing dataset, and the related conj-rows function conjoins rows. We can create a new dataset that adds the fitted (or predicted values) to the original data using the conj-cols function. You’ll notice that the column names are changed to generic ones (i.e. col-0, col-1, col-2), this is done to prevent naming conflicts when merging datasets. We can add more meaningful names with the col-names function. Another new function, $where, lets you query an Incanter dataset using a syntax based on MongoDB and Somnium’s Congomongo Clojure library. The new incanter.mongodb library can be used with Somnium’s Congomongo to store and retrieve datasets in a MongoDB database. For more information, see the MongoDB quick start guide. and use Congomongo’s mongo! function to connect to the “mydb” database on the server running on the localhost on the default port. If mydb doesn’t exist, it will be created. Now we can insert the results dataset into the database with the incanter.mongodb/insert-dataset function. The first argument, :breaking-dists, is the name the collection will have in the database. We can now retrieve the dataset with the incanter.mongodb/fetch-dataset function. Take a look at the column names of the retrieved dataset and you’ll notice that MongoDB added a couple, :_ns and :_id, in order to uniquely identify each row. The fetch-dataset function (and the congomongo.fetch function that it’s based on) support queries with the :where option. The following example retrieves only the rows from the :breaking-dists collection in the database where the :speed is between 10 and 20 mph, and then calculates the average breaking distance of the resulting observations. The syntax for Congomongo’s query-maps is nearly the same as that for the $where function, although :$in and :$nin take a Clojure vector instead of a Clojure set.